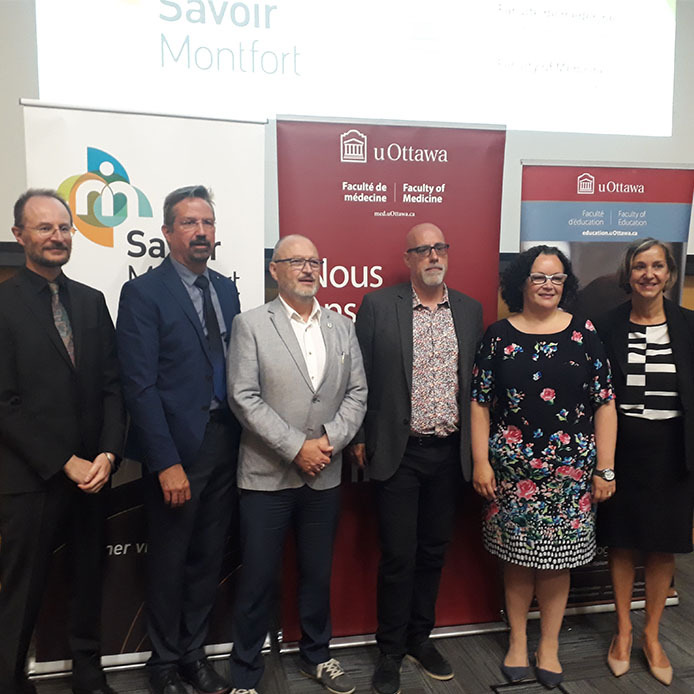 On Monday, June 18, 2018, the Faculty of Education, the Office of Francophone Affairs of the Faculty of Medicine, and the Institut du Savoir Montfort proudly launched their new Chair in Medical Education at Montfort Hospital. The five-year chair will be held by Professor Éric Dionne of the Faculty of Education. Medical teaching must keep pace with constantly evolving medical practices, hence the need for research to develop new teaching methods and knowledge to better support the health care sector. As the chair holder, Professor Dionne aims to create an innovative research program in education to optimize medical training, and in doing so, indirectly meet the health care needs of Francophones in Canada. Over the next five years, research clinicians and students, under the supervision of the chair holder, will study the conditions that foster better medical teaching and improved learning outcomes, which, in turn, will better equip health care professionals so they can provide exemplary care. The creation of this new chair in medical teaching was made possible thanks to funding from the Office of Francophone Affairs of the Faculty of Medicine; the Ottawa chapter of the Consortium national de formation en santé (CNFS), a national health care training consortium; the Faculty of Education at the University of Ottawa; and the Institut du Savoir Montfort (ISM), the research arm of Montfort Hospital. From left to right: Richard Barwell, Dean of the Faculty of Education; Jean Roy, Director of a teaching support centre hosted by the Office of Francophone Affairs, Faculty of Medicine (Centre d’appui pédagogique en santé des Affaires francophones de la Faculté de médecine); André Bilodeau, CEO of the Institut du Savoir Montfort; Chair holder Éric Dionne, Professor at the Faculty of Education and researcher at the Institut du Savoir Montfort; Manon Denis Leblanc, Vice-Dean, Office of Francophone Affairs, Faculty of Medicine; and Suzanne Robichaud, Vice-President of Clinical Programs and Chief Nursing Officer, Montfort Hospital.